Macy's had lots of excuses for its weak Q1 sales performance. But it was smooth sailing for Nordstrom and TJX. Earlier this month, Macy's (NYSE:M) reported a disappointing sales performance for Q1. Companywide sales slipped 0.7% year over year to $6.2 billion. Comparable-store sales also declined by 0.7%, though the comp decline was just 0.1% including "licensed" departments operated by partners inside Macy's stores. This resulted in a nearly 8% decline in Q1 operating income. Macy's EPS therefore dropped to $0.56 from $0.60 in the year-earlier period. Macy's stock pulled back more than 2% on the news -- though it has since recovered. Sales fell at Macy's last quarter. Macy's wasn't the only big retailer to report weak results last quarter. However, two other fashion retailers posted much better results -- and investors shouldn't have been surprised in either case. Nordstrom (NYSE:JWN) and TJX (NYSE:TJX) have been two of the most consistent retail growth companies in recent years. Let's explore why Nordstrom and TJX thrive, while Macy's continues to dive. Macy's management offered several excuses to explain why sales missed the company's forecast. CEO Terry Lundgren cited four headwinds: delayed merchandise shipments related to the West Coast port slowdown, unusually severe winter weather, lower spending by foreign tourists affected by the strong dollar, and an organizational restructuring at Macy's. Most of these issues are temporary, and Macy's still expects sales growth -- albeit just 1% growth -- for the full year. Still, it's hard to ignore the long-term trend of slowing sales growth at Macy's. In 2011, same-store sales rose 5.3% year over year. In 2012, growth slowed to 3.7%. In 2013 and 2014, same-store sales growth including licensed departments slowed to 2.8% and 1.4%, respectively. With same-store sales growth below 2%, Macy's will have to work hard just to maintain its profit margin, let alone expand it. As a result, it won't be able to grow earnings much, which could end its post-recession run of extremely strong stock performance. By contrast, Nordstrom posted strong sales growth last quarter, thanks to a combination of solid comp sales growth -- mainly driven by e-commerce -- and new store openings. The Nordstrom Rack chain has helped drive strong sales growth for Nordstrom in recent years. Nordstrom's total sales jumped 9.8% year over year to $3.1 billion ($3.2 billion including credit card revenue). The ongoing expansion of the Nordstrom Rack off-price chain contributed to this growth, with a 12% year-over-year sales increase. Comparable sales rose 4.4%, as sales on Nordstrom.com rose 20%, and off-price e-commerce sales surged more than 50% year over year. Like Macy's, Nordstrom's EPS declined last quarter, falling to $0.66 from $0.72 a year earlier. But pre-tax income would have been up slightly excluding costs related to the acquisition of Trunk Club and Nordstrom's expansion into Canada. More broadly, Nordstrom's earnings decline isn't too worrisome because it was caused by big investments that are driving strong growth. By contrast, both sales and earnings fell at Macy's. Meanwhile, off-price giant TJX continued its steady growth in sales and market share. In Q1, TJX's comparable store sales rose 5% year over year. Total sales rose nearly 6% despite a 3 percentage point negative impact from the strong dollar, which reduced the company's revenue in Canada and Europe. Whereas traditional retailers like Macy's were tripped up by the West Coast port slowdown, off-price retailers like TJX benefited from the dislocation as it increased the availability of deeply discounted goods in the marketplace. All of TJX's chains posted strong sales growth in Q1. The strong sales results allowed TJX to grow EPS 8% year over year to $0.69, thus beating the company's guidance. It also gave management enough confidence to raise TJX's full-year guidance. Macy's recent struggles show that declining unemployment and low gas prices do not guarantee strong sales growth for retailers. Yet Nordstrom and TJX were able to post solid growth thanks to their exposure to the growing off-price market and investments in new stores. 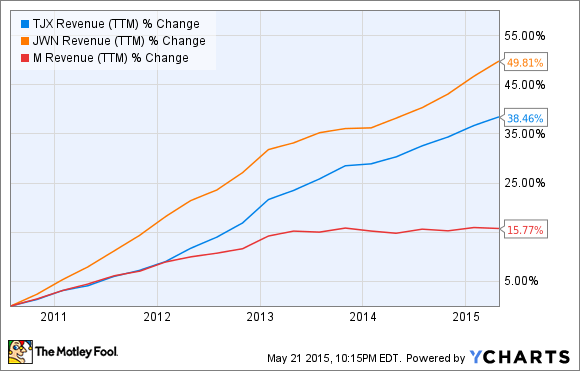 TJX, Nordstrom, and Macy's Revenue, data by YCharts. Nordstrom has grown sales by nearly 50% in the last five years. TJX has posted nearly 40% sales growth. Meanwhile, revenue has risen just 16% at Macy's -- and the chart clearly shows how revenue at Macy's has flatlined since 2013. TJX and Nordstrom shares are somewhat pricey; each trades at 18 times forward earnings. Macy's looks cheap by comparison, trading at just 13 times earnings. But the superior growth of TJX and Nordstrom will probably make their stocks much bigger winners for investors.